Allseas’ giant installation/decommissioning and pipelay vessel Pioneering Spirit successfully executed her maiden heavy lift project on Monday with the removal of the 13,500 ton Yme mobile offshore production unit (MOPU) in the North Sea. Allseas said in a statement Monday that the job demonstrates the unique single-lift capability of the Pioneering Spirit. The dynamically positioned, catamaran-like Pioneering Spirit was designed in-house by Swiss-based Allseas for single-lift installation and removal of large offshore oil and gas platforms, and the installation of oil and gas pipelines. At 382 meters long and 124 meters wide, the Pioneering Spirit is one of the largest ships ever constructed. 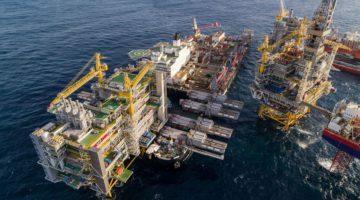 At the bow it features a 122 m long by 59 m wide slot that enables the vessel to straddle a platform and remove entire topsides in a single lift using eight sets of horizontal lifting beams. The vessel features a topside lift capacity of 48,000 tons, making it one of the most capable heavy-lift ships in the world. The Pioneering Spirit was built in South Korea by Daewoo Shipbuilding and Marine Engineering and arrived in Rotterdam for final outfitting in January 2015. The vessel has been under construction since at least 2010, but its concept design for actually dates back nearly 30 years, and was based on two tankers placed side-by-side. Edward Hereema has called the vessel one of the biggest bets of his career – rumored to cost some $3 billion to build. The vessel was originally named Pieter Schelte after offshore heavy lifting pioneer Pieter Schelte Heerema (1908–81), the father of Allseas’ founder Edward Hereema, but the vessel was renamed in February 2015 amid public outcry over the vessel’s namesake being a convicted Nazi war criminal. The Yme platform is located about 62 miles off the coast of Norway in the central part of the North Sea. The platform, which has never actually produced any oil, was previously operated by Canada’s Talisman but is now owned by Repsol. It has been unmanned since 2012 after cracks were found in the platform’s legs. The Yme platform is a jack-up type platform standing on three steel legs of 3.5 meter diameter, which are inserted approximately 10 meters inside the subsea storage tank columns at 93 meters water depth. The platform is now fastened on board and the Pioneering Spirit, headed to the newly developed dismantling yard in Lutelandet, Norway.